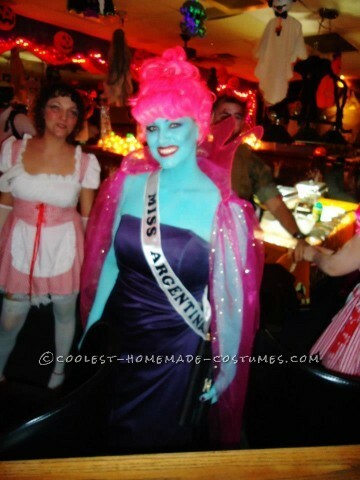 I had a lot of fun making this beautiful Dead Girl Miss Argentina from Beetlejuice costume. I was inspired by the receptionist Miss Argentina from the 1988 movie Beetlejucie. I bought the dress at Goodwill for only a $1.00 (Thursdays are dollar days). I made the cape with tulle from Michael’s $7.19 and floral wire from the dollar store. The sash was made with wide ribbon and iron-on letter $2.39 and pinned together with my great grandma’s brooch. I bought the blonde wig at Amazon for $6.00 and sprayed it with red and pink color hairspray from Walmart for $4.00 for the two cans. I bought the Mehron Paradise Makeup AQ teal body & face paint from Amazon for $13.00 and used wet and wild eye shadows navy blue and purple for the detail highlights on my eyes and cheeks. I applied the teal paint with a foundation makeup brush by dipping the brush in water then in paint. It was easy to apply and it dried on my skin, so it didn’t rub off as easy and my skin could breathe. Oh and I was able to wash it all off in one shower and with makeup remover. I was a little worried I would be tinted teal for a week…lol but that product worked GREAT! This by far might be my best costume I’ve made! It was worth the cost of $34.58 and the days making it for great costume and an awesome night out with my man and friends!!!! Coolest Caged Illusion Costume: Gorilla Gone Wild!